Haulaway Storage Containers offers high quality conex shipping container Portland solutions. Conex containers are popular for shipping and storage, and we stock a large range of sizes suitable for any size project. Why choose conex containers? They have a large storage capacity, are easy to enter, are secure, and are made of high quality heavy gauge steel. Construction sites are a rough place, and our high quality storage containers can take anything the job dishes out. We know that containers can be struck by equipment, have material such as gravel and riprap stored against them, and more. Our heavy gauge steel holds up against these hazards and more. We offer a great conex shipping container selection at our Portland, Oregon facility. All offer great headspace and storage capacity, with the largest having a length of forty feet for maximum versatility. All of our job-site containers also offer a secure locking system and easy ground level entry, for safe and easy loading and unloading. Rent a cargo container to store tools, materials, and more safely and securely. Haulaway will deliver directly to your site, and place the container exactly where you want. One call gets what you need, where and when you need it. Haulaway Storage Containers serves the Portland area from our location at 18420 SW 126th Place in Tualatin. Purchase or rent a cargo container just a quick twenty minute drive from downtown Portland. Haulaway also maintains a network of locations throughout the Western United States. This allows us to fill orders of any size, even at the last minute. 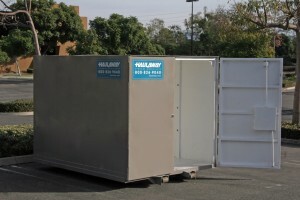 Whatever your storage needs, Haulaway Storage Containers has you covered. Whether you are looking for a single Conex Shipping Container for your Portland project, or need dozens of containers in different sizes, we can deliver what you need right to your door (and beyond).